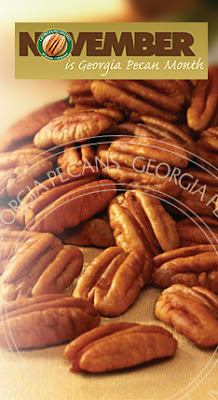 The state of Georgia is well known for pecans, even moreso during the month of November! To highlight the state of Georgia on our Regional Thanksgiving menu this year, I came across the following recipe. I prepared the recipe as follows, using vegetable broth instead of chicken broth since we had some vegetarian guests to cater for our dinner. I also have to admit that I prepared cornbread from a mix (Trader Joe's brand) to save myself from time. You're welcome to use store bought cornbread, but if you are able, homemade is always better. The Trader Joe's brand I used for this recipe worked deliciously since there were some whole corn kernels in the mix and the texture of the cornbread wasn't too dry. The key thing to note about preparing cornbread dressing is to not over handle the cornbread because it will crumble as you combine it with the dressing ingredients. Handle it carefully and gingerly... and cubing the cornbread in large pieces will prevent it to crumble too much. - If making your cornbread, make it as early as 2 days ahead. Allow it to cool and cube it up. - Toast and chop up the pecans and toss it with the cubed cornbread. - Saute the onion and celery in butter, then deglaze with wine until it evaporates. Add this mixture to the cubed cornbread and pecans. Allow it to cool and store in your fridge. 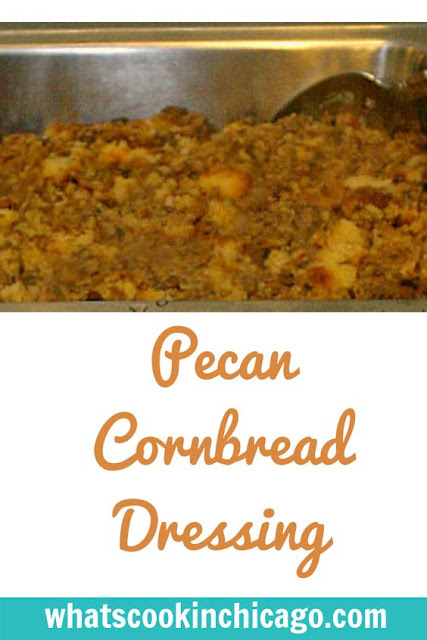 - Prepare step three of the recipe below to assemble the cornbread dressing. Place in the baking dish, cover and store in your fridge. - Pour a little broth over the stuffing and bake as directed. 1. Preheat oven to 375°F. Spread pecans on a large rimmed baking sheet, and toast until fragrant, 3 to 5 minutes; set aside. 2. In a large skillet, melt butter over medium. Add onion and celery; season with salt and pepper. Cook, stirring occasionally, until softened, 8 to 10 minutes. Add wine, and cook until evaporated, 3 to 5 minutes. Transfer to a large bowl; let cool slightly. 3. To bowl, add cornbread, sage, eggs, and pecans. Season with 1 1/2 teaspoons salt and teaspoon pepper. Pour 1/2 cup hot broth over cornbread mixture. Toss gently (cornbread will break down into smaller pieces). If necessary, add up to 1/2 cup more broth so stuffing is moist but not soggy. 4. If stuffing turkey, set aside 4 cups dressing. Spoon remaining dressing into a buttered 2-quart baking dish; pour up to 1 cup remaining broth over top to moisten. Bake, covered, for 30 minutes; uncover, and bake until browned, about 15 minutes more. Makes 12 cups. What is nice about this recipe, is that, I can make it gluten free. My own corn bread uses corn meal and rice flour so I can make that to be transformed to stuffing.